Time to play…No Way! This classroom game, a central feature of all our modules, offers a fun way for students to develop the critical thinking and science literacy skills emphasized in the Next Generation Science Standards—skills they’ll need in order to become critical consumers of scientific information and reporting. Moving away from the fantasy worlds of the video games, No Way! draws students into a compelling real-life scenario in which they are editorial interns at a science-themed website—NoWay!com. The site publishes amazing-but-true stories about incredible natural phenomena, weird inventions, and sensational events. 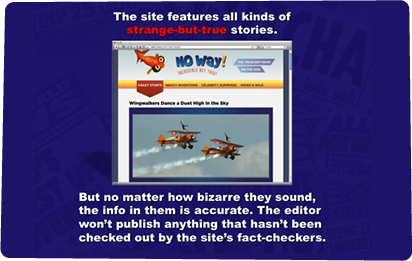 As part of the editorial team, students must investigate claims in articles being considered for publication on the site. The articles connect to the module’s content and focus on the misconception addressed in the video game. Playing No Way! gives students a chance to practice crucial argumentation skills while also deepening their understanding of the module’s topic. The articles that students evaluate were written specifically for No Way! Each contains several claims that have to be checked. The rule is that finding counterevidence for any claim means the story can’t be posted. Playing No Way! involves (a) looking for information relevant to a claim by referring to a set of reliable resources we provide, and (b) determining whether it constitutes evidence for or against the claim. While students will find evidence to corroborate most claims, the game keeps them focused on the search for counterevidence that invalidates a claim. No Way! takes 2–3 periods to complete, and each session ends with students sharing what they’ve discovered and voting on whether a particular story should be published.